Magnus | Whippet in Edinburgh. This is Magnus. 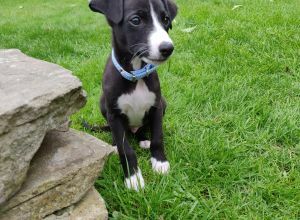 He's a furry little whippet dog, though still a puppy. So prepare for nibbles! He's a friendly wee guy who loves to socialise and loves cuddles. He also enjoys being outdoors but don't all dogs. We already have a dog walker but as we both work we're looking for people to hang out with Magnus in the day as much as possible. Ideally this would be a student who can just hang with Magnus whilst they study or someone retired or who works from home who would like a furry buddy to hang with. He grew up with kids and other dogs so neither will be an issue. Give us a shout if you would like to help!